When using with "passive" (without electronic control pin) MFT camcorders/cameras, such as BMCC 2.5K MFT and Digital Bolex D16 MFT, the Speed Booster must be powered by external power source via Micro-USB socket. Input Voltage is 5V DC. (Battery is NOT included in the box). 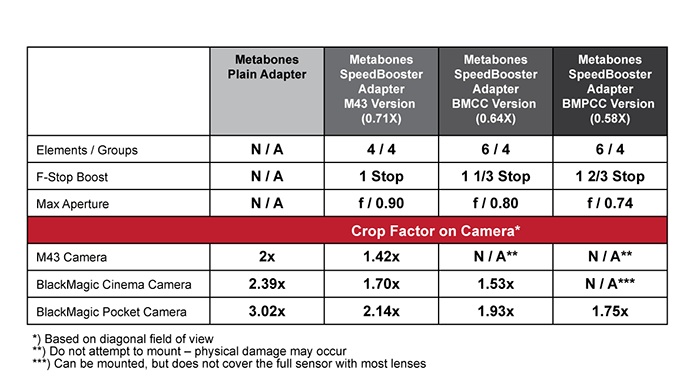 When using with "active" (with electronic control pin) MFT camcordrs/cameras, such as BMPCC MFT, the Speed Booster can be powered by camera body. no external power source required. Build-in electonics to control lens aperture. The Lens aperture is set by the dial button on the adapter. Distance and zoom display on BMPCC (with active MFT mount) camcorder (see note 1). However, this feature is not for BMCC 2.5K. This Speed Booster is designed to cover an BMCC image circle which is not big enough to cover a full-size 36mm x 24mm sensor. For use with fast lenses (faster than f/1.8), the pre-boost apertures will be displayed in the camera. Slow lenses will report boosted apertures to the camera body but fast lenses will report pre-boost apertures. We won't show f/0.7 with a f/1.2 lens attached, but show f/1.2 instead. a) EF 85/1.2L attached, camera display = f/1.2, physical aperture (lens + Speed Booster combined) = f/0.74. Many manual focus lenses (e.g. OM 28/2.8, OM 50/1.8, Leica R 15/3.5) have rear protrusions (spikes, levers, other appendages) which would damage the optics and/or housing of Speed BoosterTM They need to be modified before they can be safely used on Speed BoosterTM Check and make sure there are no rear protrusions from the adapter/lens combination before using on Speed Booster. Scratches and damages caused by rear protrusions on Speed BoosterTM are not covered by warranty. This Speed Booster may NOT be fully compatible with GH4 or other MFT camera. This is use only with BMCC or BMPCC. When Speed Booster® is used with other MFT camera, it may cause damage on the camera. Many manual focus lenses have rear protrusions (spikes, levers, other appendages) which would damage the optics and/or housing of Speed BoosterTM They need to be modified before they can be safely used on Speed BoosterTM Check and make sure there are no rear protrusions from the adapter/lens combination before using on Speed Booster. Scratches and damages caused by rear protrusions or by poor quality adapters are not covered by warranty. The following is an incomplete list of lenses known to be incompatible.